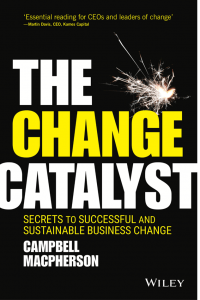 Read the introduction to The Change Catalyst by Campbell Macpherson published by Wiley. According to a 2016 Bain & Company survey of 250 large companies, only 12% of change projects achieve or exceed their projected outcomes. A further 38% produce less than half of their expected results. The final 50% “settle for a significant dilution of results”. In other words, 7 out of 8 change initiatives fail. A similar proportion of mergers and acquisitions fail. A comparable proportion of corporate strategies fail. A similar number of large IT projects fail. While there may be some debate about the percentages, Bain isn’t the only consultancy to arrive at a similar conclusion. A 2008 McKinseys survey estimated that 2/3 of change projects fail. John Kotter, in his seminal book, “Leading Change” (1996) estimated the number to be around 70%. Several studies by several consultancies over several decades have all deduced that change is so difficult to achieve, and so fraught with obstacles, that organisations usually end up abandoning change programs altogether or settling for significantly watered-down outcomes; wasting vast sums of money doing the former and foregoing opportunities for increased revenue, profit and shareholder value doing the latter. Only one in eight change initiatives deliver the results they set out to achieve. There are many reasons and they are all intertwined. But from my many decades of experience assisting organisations large and small to instigate change, I have come to the conclusion that the reasons why change projects, programs or initiatives fail can be grouped into ten key categories. This top ten is outlined in detail in Part 1 of the book. The key reason that infuses every other is the fact we humans don’t like change. When it comes to change, especially in the workplace, we have an innate desire to cling on to the status quo. We find change extraordinarily difficult; even when it is good change. We fear that the new world may not be any better than today. We fear that accepting change will be tantamount to being blamed for the way we currently work. We fear that we may try and fail. Therefore, we need help; we need someone to help take the fear away. To be encouraged to change, we need both the ‘carrot’ of a better tomorrow and the ‘stick’ of negative consequences if we were to stay with the status quo. Sometimes we require a “burning platform” to force us to take the leap into a new world; other times the motivation needs to be far more subtle, but it must be just as compelling. However, rational motivation alone is not sufficient; we humans need to be motivated emotionally if we are to embrace any sort of change. Our pride, our ego, our sense of self-worth, our heart, our gut; these are the areas that need to be motivated if we are to successfully proceed down a new path. When it comes to engaging people in change, logic alone is simply not enough … and rarely do change programs expend anywhere near enough time or energy providing a positive emotional reason to embrace the new world or addressing the emotional barriers to change. You need look no further than the disastrous campaign to Remain in the EU by the then Prime Minister, David Cameron, and Chancellor, George Osborne, during last year’s UK referendum. These two highly intelligent men and their teams of advisers completely ignored the fact that it is our emotions that drive our decision-making. They tried to convince people to vote ‘Remain’ through a mixture of logic, statistics and fear. They also completely lacked empathy; failing to understand that, for a large proportion of Britons, the ‘platform was already ablaze’ – too many voters felt they had nothing to lose by voting to leave the EU. These voters had been left behind by globalisation and the free movement of people across the EU and had spent eight long years reaching into their own pockets to pay for the failure of the global banking system in 2008. They needed a positive emotional reason to vote for the status quo – and none was forthcoming. Another school-boy error from the Remain camp was complacency (a common cancer that scuppers many change initiatives as we discuss later in the book). Cameron and Co didn’t seriously consider that the UK voters would actually vote to leave – either because they honestly didn’t understand what life was like for a large proportion of their constituents or they simply assumed that ‘fear of the unknown’ would win the day. Either way, their complacency was palpable. In direct contrast, the ‘Leave’ camp, spearheaded by the opportunistic Boris Johnson, appealed directly to the emotions of many millions of voters with a brilliant slogan, “Vote Leave Take Control”, a catchy “Brexit” name and, most important of all, the promise of a better tomorrow outside of the EU. It worked. The UK voted to leave the European Union by 52% to 48% . A key reason for the win is that the Leave campaign spoke directly to voters’ emotions. They acknowledged that people were already unhappy with the status quo and fearful for their future livelihoods and the future of their communities if things kept heading in the current direction. The Leave campaign also spoke directly to a significant proportion of the population’s latent fear of foreigners but, more powerfully, it spoke to people’s pride in their country. Boris Johnson and co gave the electorate the belief that Britain could stand on its own; they appealed to the nationalistic emotion that, to borrow Donald Trump’s superficial but nevertheless catchy slogan, Britain could be ‘Great’ again. Donald Trump made none of Cameron’s mistakes. He may have made plenty of others during his divisive and ultimately successful election campaign, but unlike Cameron he did not suffer from complacency, he was long on emotion and he knew that a significant proportion of the population was crying out for change – any change. Trump voters could be divided into three camps: ‘The Tribals’ who always vote Republican and don’t have to waste one moment thinking about it. Every political party has them. ‘The ABHs’ (Anyone But Hillary) who loathe and distrust anything Clinton. This is a surprisingly populous group. The third group is ‘The Victims’; the victims of globalisation. Like their British counterparts, these Americans have been left behind by globalisation and felt that they literally had nothing to lose. They had been continually ignored for decades by political elites of all persuasions and were ready to vote for almost anyone that they hoped could help them – as long as their surname wasn’t Clinton or Bush. Hence an outsider, anti-politician has become the 45th President of the United States. But back to the world of business … a 2004 study of some 50,000 employees by the US-based Corporate Executive Council showed that, when it comes to engaging employees, emotional commitment is four times more powerful than rational commitment. Four times. To convince people to change we have to appeal to their emotions. In business, as in life, there is a ‘right’ reason and a ‘real’ reason for just about everything. This is especially pertinent when it comes to change. The ‘right’ reason for the change will be the one that is widely communicated. But lurking in the shadows will almost always be a ‘real’ reason that is not made public. When it comes to finding your people’s emotional triggers, you will need to unearth the ‘real’ reasons behind their resistance and the ‘real’ things that will genuinely motivate them. This book has been designed to help you do precisely that. This book starts with Part Zero: a discussion of the inevitability of change – highlighting some of the incredible changes we have already managed to cope with and previewing just a little of the tsunami of change that will soon be crashing down upon us. The book is then it is divided into four key parts.